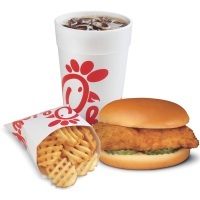 You can blame Dan Cathy for my short blog post today. I didn’t have a chance to write one last night, and that always means writing one on lunch break. But my lunch break today is going to being taken at Chick-fil-A! I’m not normally one to get caught up in boycotts or support movements, but I really do appreciate the stand that the Cathys are willing to take on the biblical definition of marriage. I also worked at a Chick-fil-A for a summer, so I suppose I still have a bit of loyalty from that. But do you want to know the real reason I’ll be dining there today? Just in case you’ve been living under a rock for the past few weeks, here are the must-read articles to get you caught up. Are you eating at Chick-fil-A today?